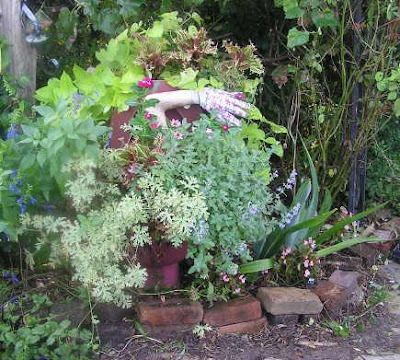 I love this recycled planter made by one of my gardening junk friends several years ago. 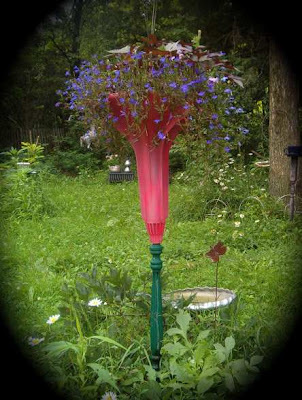 She used an old washing machine agitator... turned it upside down and attached it to a pipe sunk into the ground. It reminds me of a big pink lily! It is possible none of you will recognize the origins of this lovely planter.... and instead of telling, I'm gonna ask you to take a guess. I can give you a hint... I'd LOVE to have it in my back patio... and I just love junk. 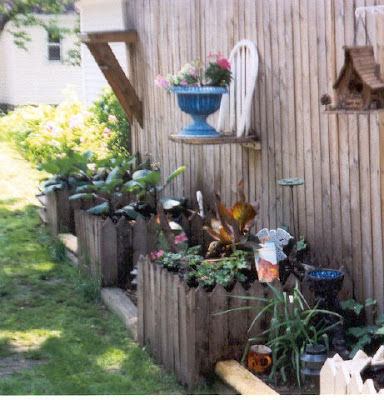 My mother put the head board and foot board from a bed in her large planter. It became her "flower bed." My guess is your mystery planter has mannequin parts. I'm very new to this blogging thing and am not sure which direction this will take.... for now I intend to post information about my own interests... everything from art to holiday traditions to vintage photography to mosaics and bottle trees... gardening and puppies.... just whatever catches my attention at the time. I am retired and have Pulmonary Hypertension. I'm including a link to this little known disease with the hope some of you will read about PH and perhaps be able to recognize the symptoms in someone else or yourself. Currently it is a not too well understood disease which seems difficult to diagnose because most physicians don't see it often. PH is one of the so called 'orphan' diseases, but is becoming less so... thanks to people like you who become more aware.